I’m sure Sam Walton is spinning in his grave. The man who billed his store as “All-American, and American Made” now has a huge business in China, with All-Chinese made products. 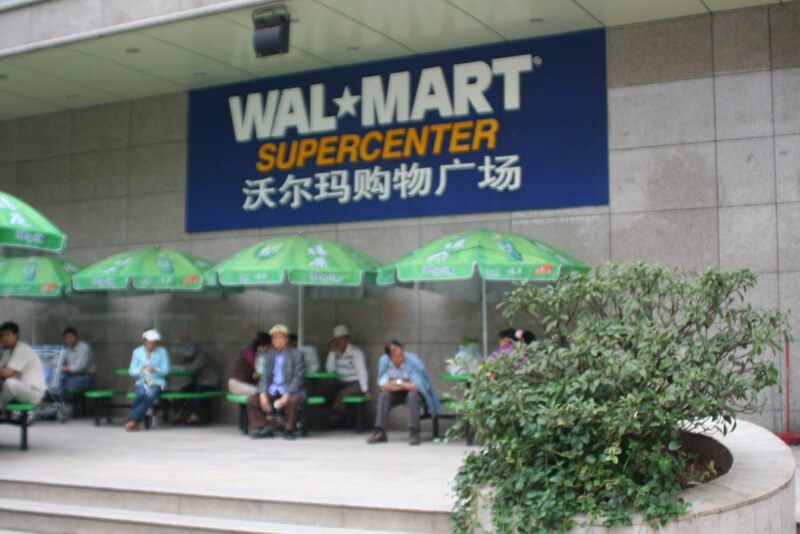 We’re in Kunming, the capitol of Yunnan Province in the South-west of China, and our room is right around the corner from Yunnan’s first Walmart …how could we resist? I have to say, our trip to Walmart was eerie, everything is exactly the same, except better. There’s someone at the from door to greet you, there are those silly Walmart “happy faces” on all the store advertisements. The workers wear the same uniforms, only the vests have the Walmart slogans in Chinese characters. The two biggest differences: Walmart workers here are all in a union (albeit a union that demands they work even harder, longer and more cheaply than even their American counterparts), and all the food at this Walmart was completely fresh – We have now been to a Walmart that has a bakery on the premises, a butcher that lets you pick out your own cuts of meat, and fruits and vegetables that don’t look like crap. Amazing, we owe it all to you Sam!